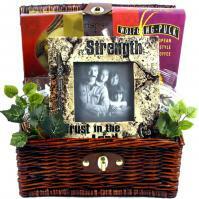 Sympathy Gift Baskets Bring Comfort Even in the Saddest of Moments. 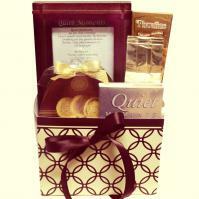 Sending a sympathy gift basket delivery is the perfect way to express your condolences. 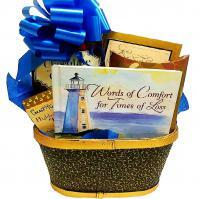 Our beautifully designed, visually uplifting sympathy gift baskets are an excellent way for you to politely express sympathy and provide a measure of comfort during times of suffering and loss. While we may not always know what to do or say during these difficult times, sympathy gift baskets convey your condolences smoothly and with the utmost elegance. It is typically difficult to watch someone you love going through a painful experience. It is hard to find the right words to say or the right thing to do. Quite often, it is easier not to say or do anything to avoid the uncertainty and fear of doing the wrong thing. Unfortunately, this type of behavior isn’t going to help much. Instead, why not learn how to act and what to say to make someone feel better when they are going through a difficult time. Whether your friend or relative is going through a divorce, battling cancer, or experiencing the death of a loved one, it is important to do or say something so that you can make a positive difference in the way that this person feels. After all, if you don’t do or say anything at all, how is your friend or relative going to know that you care? Despite how difficult this might be for you, express your concern, sympathy, or support for this individual so that she knows that you are there if she needs you. You do not have to make a speech or go into a lengthy discussion. Instead, make a simple statement that mentions your care and concern for the individual or offer your help in a short, heartfelt sentence. The tone of your voice is more important than the words at this point. Speak in a soft, gentle manner in a soothing tone of voice. Later, after time has passed, you should make another attempt to offer your help and support. This second offer reinforces the sincerity of your concern. Remember that even small comments allow the other person to know that someone is thinking about them, a fact that offers some solace. Another way that you can express your concern or sympathy is to send occasional emails or notes in the mail. This way, you are keeping the line of communication open without being overbearing or annoying. This type of repeat communication tells the individual who is going through a difficult time that you truly care. Once you offer your sympathy or condolences, listen to the other person. Allow him to express his pain without interrupting him. Additionally, as you listen, avoid the urge to say that you understand how he is feeling. While you might have gone through similar circumstances, you do not know exactly how he is feeling. You might have an idea, but you are not going to know exactly how he is feeling. You should also remember that sometimes listening to the other person includes listening to his silence. If he needs to just be near him without talking, this is what you should do. Sometimes, silence is just as important as having a conversation. Always speak in a personal tone of voice. Avoid negative words or negative comments. Try not to use the word “but” when speaking since it negates the part of the sentence that goes before it. You should use the word “and” instead to express your concern in a more positive way. Instead of saying something such as “I know it hurts now, but you will feel better later,” say “I know it hurts now, and I know that you will discover the strength to get through it.” Although it is a difficult time for your friend, you should focus on comforting words that make mention of pleasant times or circumstances. Knowing just the right phrases to say and how to say them can be difficult for anyone in a trying situation. Pick up a few tips and improve the way that you handle difficult emotional circumstances. 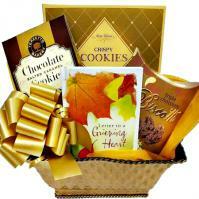 A Sympathy basket delivered, comforting care package or thinking of you gift box can include fresh fruit, gourmet food, fresh baked cookies, sympathy tea, gourmet coffee, inspirational booklets filled with with inspirational messages, keepsake memory gifts and much, much more. 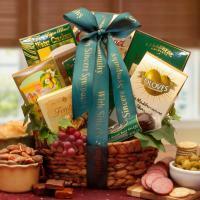 Choose the perfect sympathy basket to send today. Of course, during difficult times, your most precious gift to the bereaved is the gift of simply letting them know that you care. During their time of sorrow and sadness this gift alone can make his or her grief more bearable. "I just wanted to write and tell you how quickly your customer care consultant acted on behalf of your company, Adorable Gift Baskets. After the death of my beloved sister I have had a very difficult time organizing my thoughts and taking care of the many thank yous that come with the death of a loved one. Your conscientious customer care has saved us such an incredible amount of hassle and trouble trying to get gifts out. Customer Service like this is what sets companies like yours apart and makes you stand out from the rest. So do your baskets which we think are superb. We are so impressed and grateful that we will sing your praises loud and clear to whomever we encounter. Thank you for a job well done. Sincerely Mary D., Marketing & Creative Services - New Fairfield, CT 06812"